Various drug delivery systems are being rapidly developed for controlled drug release, improved efficacy, and reduced side effects with the goal of improving quality of life for patients and curing disease. 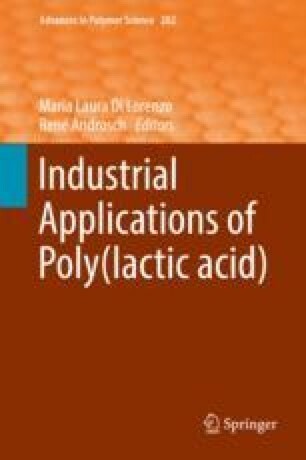 Poly(lactic acid) (PLA) possesses numerous advantages compared with other polymers, including biocompatibility, biodegradability, low cost, environmental friendliness, and easily modified mechanical properties. These properties make PLA a promising polymer for biomedical applications. This review introduces the specific characteristics of PLA that enable its application for controlled drug delivery and describes different forms of PLA used for drug delivery, including nanoparticles, microspheres, hydrogels, electrospun fibers, and scaffolds. Previous work is summarized and future development is discussed.